Sankt Petri kirke is the oldest building still standing in Copenhagen. The main nave and tower was built around 1450. The church has undergone many changes along its long history. It is located on the corner of Nørregade and Sankt Pederstræde. It is a beautiful historic monument. 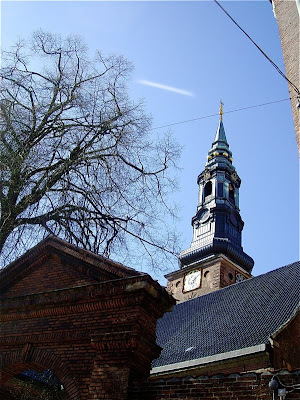 The church was one out of four catholic parish churches in the Danish capital, and was given as a gift to the German community by Fredrik II in 1585 and has since then belonged to them. Much of the political, financial and military elite in Denmark, as well as the members of the court had German origins. The church rapidly became a center for this influential group. During the 17th century Sankt Petri kirke did not escape the attention of King Christian IV. 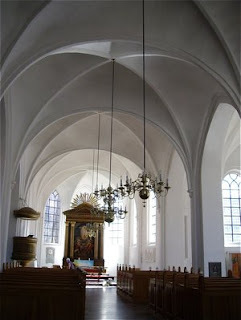 He added a nothern and a southern nave 1631-1634 creating the cross shaped structure standing today. As the community grew rapidly, another northern wing was added by Christian V around 1725. In 1848 Denmark and German declared war as the two regions Slesvig and Holstein demanded independence. This was a turning point for the German community in Copenhagen. The Medieval building fell partly into disrepair. The Danish state took over the building in 1994 and was completely restored. It now belongs to Slots og Ejendomsstyrelsen, under the Danish Ministry of Finance. The church has a beautiful clean white interior with wooden details, Gothic vaulted ceiling. On one of the walls you find this beautiful painting. 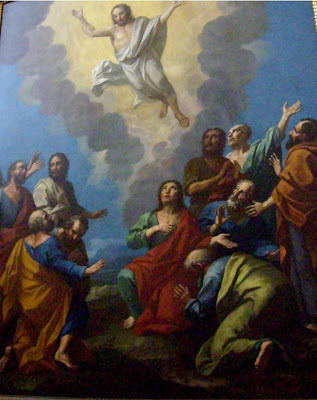 The ascension of Christ was painted by Hendrick Krock (1671-1738). Krock was born in Flensburg, now in Germany, and rose to became court painter under king Fredrik IV and king Christian VI. This painting was given to the church by Carl Adolph von Plessen (1678-1758), one of Denmarks richest nobles. Krock was an extremely productive artist and paintings from his hand are or were hanging in many important buildings around the Danish capital. Some have been lost in fires, among them the famouse depiction of Judgement day that was lost in the fire at Christiansborg Palace in 1794. Many influential members of the community are buried in the mausoleum connected to the church. I will return to this interesting monument later.